1XBet is most well-known for its online sports betting services, but the brand also offers an extensive real money casino site, with hundreds of slots, table games and live dealer games available from some of the industry’s leading software developers. Despite its impressive game offering, the 1XBet Casino comes with a questionable reputation, with some other sites reporting 1XBet is known for running stolen content and offering casino services from domains outside of its licensing agreement. The team at Betting Planet has put 1XBet Casino to the test to see for ourselves what the 1XBet Casino has to offer and whether this casino site can be trusted. 1XBet Casino does not accept players from United Kingdom, USA, Austria, Belgium, Bulgaria, Croatia, Cyprus, Czech Republic, Denmark, Finland, France, Germany, Greece, Hungary, Italy, Netherlands, Poland, Portugal, Romania, Slovakia, Slovenia, Spain, Sweden, Iran. 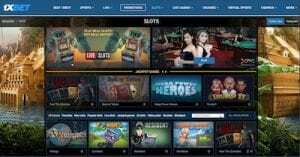 In addition, casino games from some software providers are restricted from players in certain countries. For example, games from leading software studio NetEnt are not offered to players from Australia, Canada and several other countries. You will find these restrictions under the ‘General Terms’ section of 1XBet’s Terms & Conditions section, which is updated regularly – we suggest you read through the fine print before signing up to ensure you’re aware of what games are available to you and whether any restrictions apply. During our testing of 1XBet, we spoke to the live chat customer service team who confirmed there are no sign-up offers strictly for casino games. This is a big thumbs down in our books, with plenty of other reputable casino sites offering excellent welcome bonuses for new players. Those who are wary about downloading casino software need not worry when playing at 1XBet Casino, as all games are available for instant-play with no download required. Games load directly over your Web browser just like you were viewing any other website, so you get quick access to all games whether you’re using Safari, Chrome, Firefox or any other major Web browser. Hover over the game you want to play and you will be given the option of playing for free in demo mode or playing for real money. To play for real money, you will need to sign up for an account and make a deposit first. For those who prefer the convenience of mobile play, 1XBet offers an instant-play mobile casino platform compatible with all major modern smartphone and tablet models. When opening the mobile site, you will automatically land on the sports betting page, but just click the options button in the left-hand corner of the screen to switch to play slots, live dealer or table games. A downloadable app is also available, but the main focus of the app is on the sports betting component of the 1XBet brand, so for casino players, the browser-based mobile platform is the best option for portable play. All you need is a reliable Internet connection. 1XGames – From what we can tell, this category offers 1XBet’s proprietary casino games, housing unique titles we’ve never seen before at any other casino site. This mixed bag includes casino classics like baccarat mixed in with niche titles like Dominoes, Pachinko and Thimbles, plus 1XGames raunchy adult games of 21 and Higher VS Lower. You need to be a registered player at 1XBet Casino to access the 1XGames selection. Withdrawals can be made using over 100 different payment methods. The minimum and maximum deposit and withdrawal amounts depends on the payment method you are using and the currency you are playing in – we recommend heading to 1XBet and checking out the ‘Payment Methods’ tab at the bottom of the homepage for full details. 1XBet Casino is owned and operated by a company called Exinvest Limited with an official address based in Cyprus. The casino has a Curacao eGaming license issued by the Government of Curacao under license number 1668/JAZ, which some other sites have reported as being invalid and operating outside of its licensing agreement. We have been unable to confirm the status of 1XBet Casino’s Curacao license, but given the warnings on other gambling sites we highly recommend players who choose to play for real money at 1XBet Casino proceed with caution. The live chat function seems to be manned 24/7, and the site promises that all emails will be answered within 24 hours of enquiry. 1XBet is a tricky one. Despite the odd and somewhat confusing layout of the casino game categories, the game selection is impressive, with a huge range of games available from heaps of the best casino software developers. But there are too many dodgy things about this casino for us to recommend it – 1XBet has been blacklisted at several other sites under accusations that it is running pirated gaming software and running outside of its licensing agreement, so the reputation is very questionable. Besides, there are no sign-up bonuses for casino players, which is a huge downside. We recommend you use your judgement with this one and only play at 1XBet Casino at your own risk.